The Hong Kong protests have put Xi Jinping in a difficult spot. The difficulty for the general secretary of the Chinese Communist Party (CCP) is not the student protests, it is the actions of the Hong Kong government that at every turn have made the protests harder to handle. For instance, using triads to beat peaceful protesters only brought more Hongkongers out onto the streets, while inviting worldwide condemnation. Unleashing the gangsters was only a mistake if one assumes Chief Executive Leung Chun-ying is attempting to make things in Hong Kong better. His goal is actually to make the situation as difficult as possible. Leung is a loyal soldier in the faction grouped around former Party head Jiang Zemin. Jiang and his group called the shots in China for over two decades, and they look upon Xi Jinping’s power as something to be downgraded and discarded as quickly as possible. Since Xi took power, the Jiang gang has sought out any opportunity to create chaos and confusion. If they can make a situation unstable enough, it may blow up in Xi’s face. Then Jiang’s crew will be there to take advantage. This situation early this summer in the East and South China Seas is instructive. Vietnam was becoming increasingly bellicose as it watched a giant Chinese drilling platform, accompanied by an armada of 80 Chinese ships, begin exploration in its waters. At the same time, close calls involving Chinese and Japanese jets began happening more and more frequently in the vicinity of the disputed Senkaku Islands. Observers felt an accident could tip the region into war. Then, on June 30 Xi’s administration announced the arrest and purge of Gen. Xu Caihou. Xu was formerly one of the two top deputies who ran the Chinese military and a close ally of Jiang Zemin. The news of his arrest was described as an “earthquake” in China’s state-run press. That earthquake got someone’s attention. Soon after, the drilling rig and its fleet of ships sailed away. The skies in the East China Sea quieted down. The international incident was over. Xi should learn from this past success. Just before the crisis started in Hong Kong, Xi was methodically laying the groundwork for the arrest of Jiang Zemin. Inspection teams had set up shop in Jiang’s home base of Shanghai. His associates were being investigated and arrested. Somewhere in Beijing, the dossier on Jiang was rapidly getting fat. No doubt, the memo explaining to the cadres the need for taking down the former paramount leader was being drafted. Xi should now set aside these preliminaries and pull the trigger on Jiang’s arrest. At the same time Xi should also take down Party heavyweight Zeng Qinghong. Zeng is Jiang’s former powerbroker and the man who has taken credit behind the scenes for the various schemes that have roiled the peace of Hong Kong so badly over the last few years. As a piece of housekeeping that will be almost ignored in the fall of two men responsible for decades of the perverse misrule of all of China, Chief Executive Leung Chun-ying should be dismissed from his post. The arrests of Jiang and Zeng will shock the entire Chinese Communist Party, the people of China, and the people of Hong Kong. The mischief coming from the government of Hong Kong will instantly cease. The people of Hong Kong will feel satisfied at the departure of Leung, who is widely hated. Recognizing that the arrests of Jiang and Zeng end an era, Hongkongers will hold their collective breaths for a moment to see what Xi Jinping intends to do. The stage will be entirely his. If Xi seizes that moment and seeks to console the Hong Kong people, the divisions that appear at the moment to be so rigid will soften. If he appoints a new chief executive who will work with the Hong Kong people to solve the city’s problems step by step, the city’s people will seek reform through compromise and negotiation rather than confrontation. Whether Xi Jinping would take this advice if it were offered him is hard to know. Xi has been a Sphinx to those outside his immediate circle. This has had its uses. Maoists and democrats both see in Xi a fellow traveler who is prevented by circumstances from revealing his true self. And so both cheer for his success, even though they can’t say with certainty what that success will finally bring. So long as Xi’s success involves the defeat of vile characters like Jiang Zemin, friends of China can be confident in rooting for him. A Xi who wants the best for his nation will be inexorable in rooting out his enemies while offering a hand of peace to those whom his enemies formerly abused. As people around the world have been glued to their TVs watching the democracy protests unfold in Hong Kong, they have seen the shame Chief Executive Leung Chun-ying has brought on this proud city. Gangsters and thugs have long played a semi-official role in Hong Kong, being introduced into the city’s politics by Zeng Qinghong, who held the CCP portfolio for Hong Kong and Macau for around a decade. At Zeng’s direction, triads were used to buy votes for favored candidates and to intimidate democrats, but they operated more or less out of the limelight. Under Capo Leung thugs have become a regular part of the city’s public life. A group called Hong Kong Youth Care Association suddenly appeared in June 2012 (after Leung was elected, but before he took office) at a railway stop near the China border where practitioners of the Falun Gong spiritual discipline had a booth at which they gave passerby information. The Youth Care Association group swathed the simple Falun Gong site in huge banners that slandered the practice, held megaphones inches away from practitioners ears and cursed them, and beat the practitioners when they were momentarily out of sight behind the giant, insulting banners. This scene was soon repeated throughout Hong Kong. In addition, entire areas of the city were covered in the Youth Care Association’s giant banners, often creating traffic hazards. The police for the most part did nothing, just as they did nothing when the gangsters beat the democracy protesters. The thug work pays well. Youth Care Association members told Falun Gong practitioners they were paid US$50 a day—a substantial wage for someone from the mainland, where the average annual family income is US$2,100. A Hong Kong magazine found the Youth Care Association had ties to Beijing; its leaders were CCP members, and it shared office space with the Party organization tasked with persecuting Falun Gong. A source familiar with the matter told Epoch Times Leung Chun-ying helped organize the group. During Leung’s term, another mysterious group called Voice to Hong Kong has devoted itself to harassing democrats. At a community forum in August 2013, Leung cast aside any pretense that he had nothing to do with the thugs bedeviling the city. While he spoke inside, tattooed men with spiked hair beat those who had come to protest Hong Kong’s chief executive. The police did nothing, and faced no reprimand for their inaction. A longtime staple of CCP propaganda is to blame the United States for interfering in China’s internal affairs. This chestnut is trotted out at every opportunity. Blaming the United States inflames patriotism, which is famously the last refuge of scoundrels—that is, Party officials. And it may at least distract the Chinese people from the CCP’s stupendous crimes and failures. Since the Hong Kong protests began, China’s state-run media has hit the-blame-the-U.S. button hard and often. Unlike some other occasions, when the United States might be chastised, for instance, for a poor wheat harvest in Inner Mongolia, the Party propagandists may this time be onto something. Of course, one might wish the U.S. government would be more vigorous in supporting the protesters, although private citizens, including three former U.S. consul-generals who served in Hong Kong and the New York Bar Association, have tried to take up the slack. But actual U.S. support for the protesters is not what bothers Beijing. The U.S. example of a vigorous and free republic that enjoys the rule of law and the protection of individual liberties inspires democrats in Hong Kong and other places seeking to escape from the shadow of tyranny. That example has always struck fear in the CCP. It explains why the Party seeks to control every byte of information that goes into China. 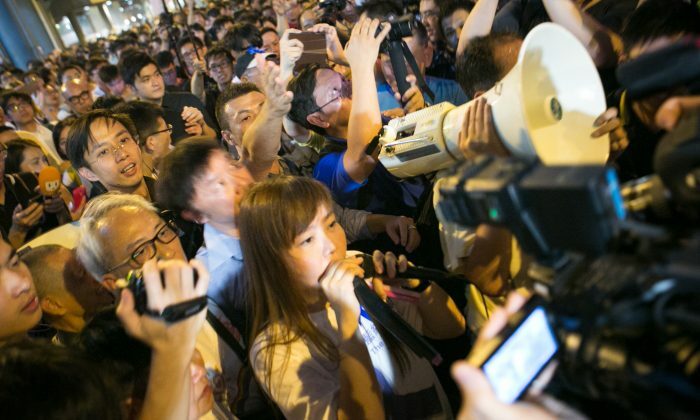 If the Party did not take so seriously the tasks of blocking, censoring, and distorting information, all of China would look like Hong Kong today, filled with democracy protesters. That’s a thought that might make a grumpy newspaperman smile. Talks were cancelled between student protesters and the government, the day before a substantive discussion was to begin. Leung has been Beijing’s man in Hong Kong as chief executive since early 2012. The Communist Party backed him—until now.